Following the long-established large-form Amati cellos, the pre-1700 Stradivari cellos were all made on a large pattern, with the 1701 ‘Servais’ being the last extant cello of this type. From 1707–1725 the ‘forma B’ model was the standard. Then after 1725 two additional models of a smaller size were introduced: a narrow model referred to on the paper pattern as the ‘forma B piccola’ and a shorter model for which no known pattern or mould survives. With its smaller dimensions, slender purfling and edgework, the ‘Bein, Fruh’, like other shorter model cellos, has a somewhat diminutive appearance. The arch is low and broad with a small amount of recurve around the edge, while the varnish is a rich reddish-brown color over a golden ground. The filled hole in the back between the upper corners probably facilitated the use of a hook and strap while playing the cello. Called a ‘processional hole’, it is evident on many 17th- and 18th-century cellos, including the ‘Comte de Saveuse’. The two-piece back is of poplar or willow cut on the slab and although it may lack the visual beauty of the stunning maple backs seen on earlier ‘forma B’ examples, it is acoustically first rate. The wood for the ribs is plainer than the back while the scroll is made from fruit wood. The two-piece top is of spruce with pronounced and variable grain lines. The use of non-maple for the back and head was quite common for post-1725 Stradivari cellos but certainly not exclusive: for example, the ‘Comte de Saveuse’ and the c. 1730 ‘Vaslin Composite’ have a similar combination while the ‘Pleeth’ has a maple back and scroll. 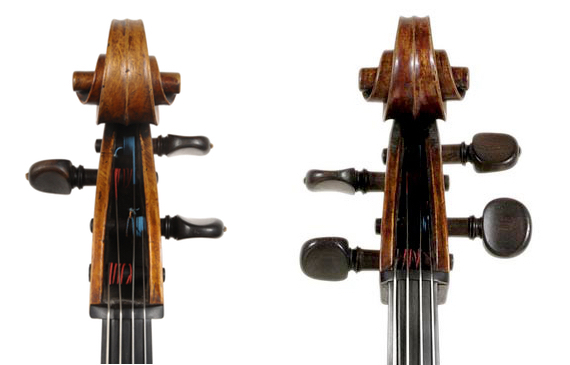 The ‘Bein, Fruh’ f-holes are typical of the shorter model Stradivari cellos: slender and well cut with long, strongly fluted lower wings and small upper lobes, they are widely spaced on the body and set in an upright stance. 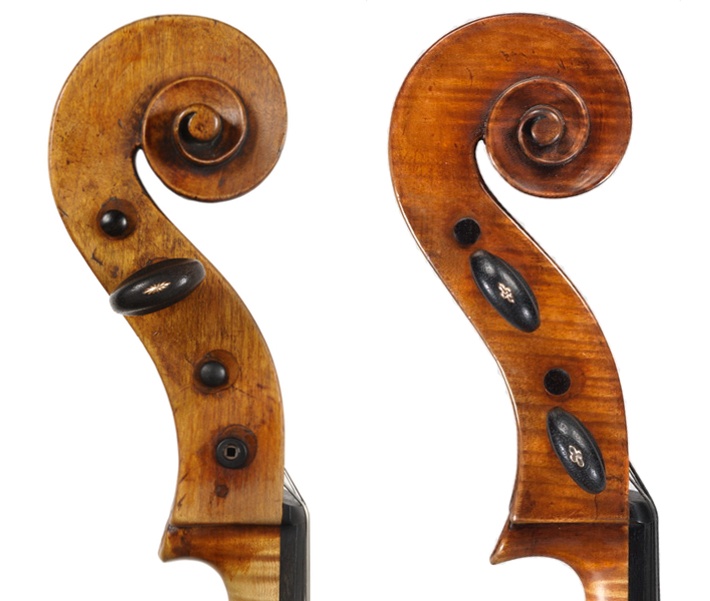 Interestingly the f-holes on the ‘forma B piccola’ cellos are distinct from the shorter model and were probably the work of another hand in the shop: leaning inwards, they have a more angular and less flowing shape, which is accentuated by the slightly stouter and less fluted lower wings. From the front, the low second turn of the ‘Bein, Fruh’ scroll gives it the characteristic Bergonzi appearance with the ears sticking out, while the front view of the ‘forma B piccola’ scrolls such as the ‘Vaslin Composite’ have a more traditional Stradivari look. Another feature of the ‘Bein, Fruh’ that points to the collaboration of Bergonzi are the pins at the top and bottom of the back. Their somewhat squarish shape and slightly off-center placement inside the purfling are details more commonly associated with the work of Bergonzi. 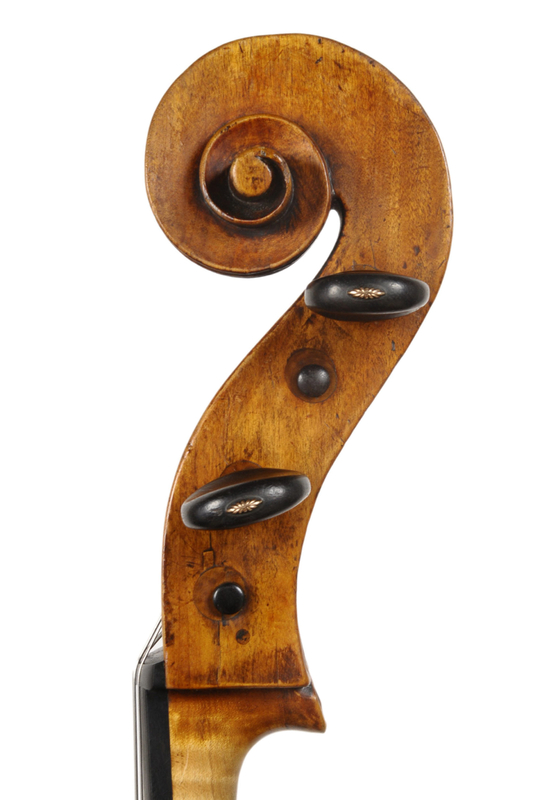 By contrast, the c. 1730 ‘Pawle, Ben Venuto’ cello has round pins that are centered on the back and bisected by the purfling, which is more typical of Stradivari’s output. 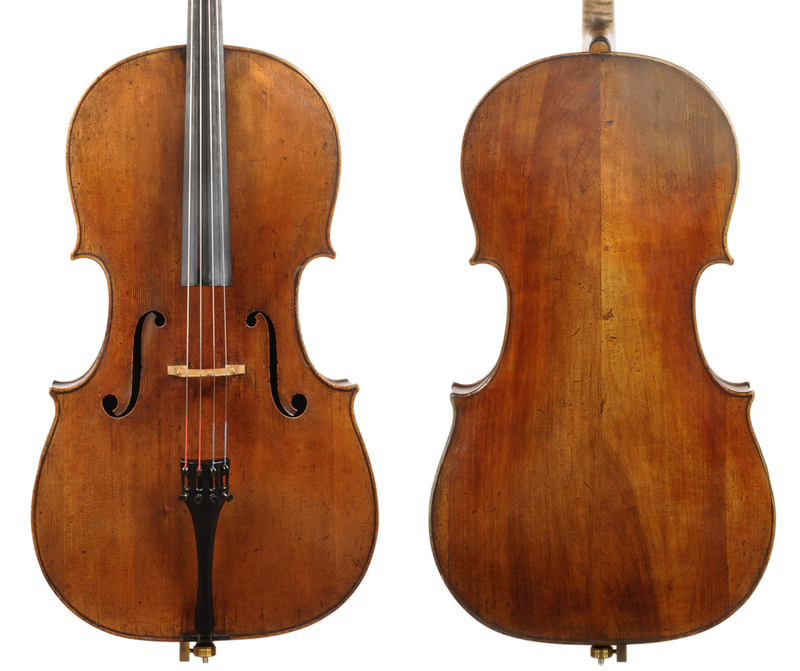 Many of these post-1725 cellos do not have original, unaltered labels, either because they have been changed to reflect an earlier date of production or because they were replaced entirely. Of the shorter model cellos the ‘Stuart’ and the ‘Comte de Saveuse’ have original Antonio Stradivari labels dated 1732 and 1726 respectively, while the ‘Pleeth’ has a ‘Sotto la Disciplina d’Antonio Stradivari’ label dated 1732. Perhaps the ‘Bein, Fruh’ [like the ‘Pleeth’] had a ‘sotta la disciplina’ label as well and was sold as such? The ‘forma B piccola’ cello is certainly a derivation of the ‘forma B’ model, with its close resemblance in both appearance and name; however, the inspiration for the shorter model cello is more mysterious and may well be from the cellos made by Francesco Rugeri. 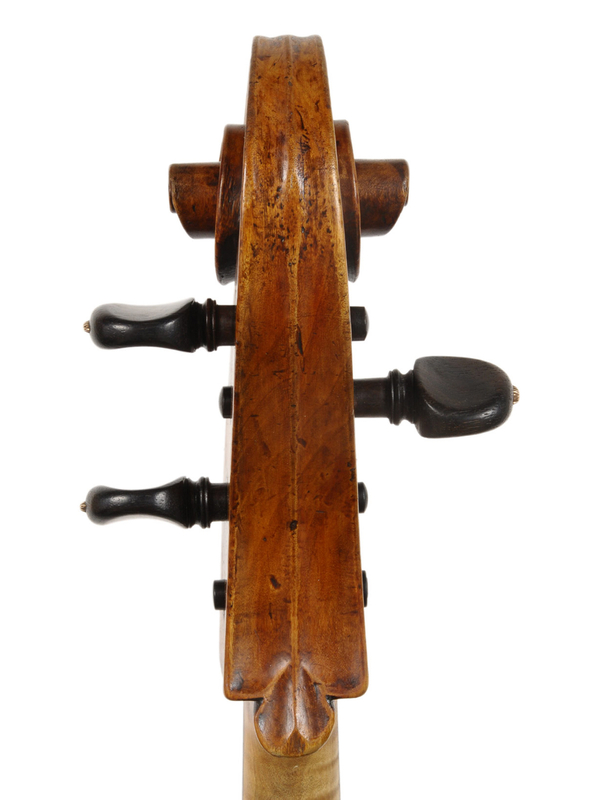 Beginning in the late 17th century, Rugeri was one of the first makers to produce a smaller cello. This model, in which the widths were generally kept broad while the length was shortened, successfully produced a cello with more manageable dimensions for virtuoso playing, while maintaining the requisite projection needed for a concert hall. Even though these Rugeri cellos are not as small as the ‘Bein, Fruh’, they do have a box-like outline that prefigures the look of the shorter-model Stradivari cellos. In part 2 Julian Hersh examines the c. 1730 ‘Vaslin Composite’ Stradivari cello, an example of the ‘forma B piccola’ model. Ernest Doring, How Many Strads? Op. Cit. Carlo Chiesa, Duane Rosengard, The Stradivari Legacy, Peter Biddulph, 1998. Christopher Reuning, Carlo Bergonzi, A Cremonese Master Unveiled, Fondazione Antonio Stradivari, 2010.